I first fell in love with the Finnish design house Marimekko when Anthropologie started to carry some of their pieces a while back. As someone who loves pattern and color, Marimekko is right up my alley with their graphic, colorful prints. A couple of years ago, I snatched up a couple pieces from their collaboration with Banana Republic, so you can imagine how excited I was when Target announced this year that they would be jumping on the Marimekko bandwagon and doing their own collaboration. I will be honest, though, because when I flipped through the Target look book a week before the line launched in stores, I was a little bit disappointed. Don't get me wrong, I loved the prints, but most everything was swimwear/beachwear and despite the fact that I am an L.A. girl, this doesn't really fit in with my lifestyle, as I don't hit the beach/pool very often! You will notice that I am back at my favorite wall in Pasadena, which is located in the parking lot of an arts school. I was appalled to see that people were actually using the parking spots near the wall for parking cars! Oh the humanity! As a result, I only had a small section of the wall with which to work, but luckily the colors of the portion of the wall that was not obscured by cars matched my ensemble, so it was all good. Great shirt! And I'm sure you'll have fun with the shorts! Hands down! 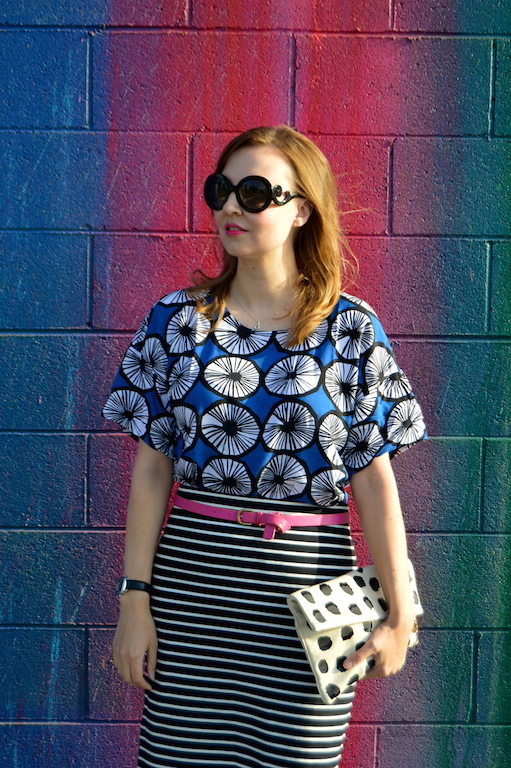 You're not only the master of color, but you know how to mix pattern so effortlessly too! Great style i love the sun glasses! this is an amazing look! I am so mad at myself for not taking advantage of the Target drop while looking at all of the lovely looks that everyone is putting together! love how you paired everything here, even the backdrop!! Beautiful job mixing prints! I love the background for your photo too. Beautiful print mixing. I can't wait to see how you style the shorts. What a great line and finds. I felt the same way about the collection--I loved the prints, but most pieces didn't really fit my lifestyle either. I'm so glad you got that top though, it looks really wearable. Love it with the stripes too! 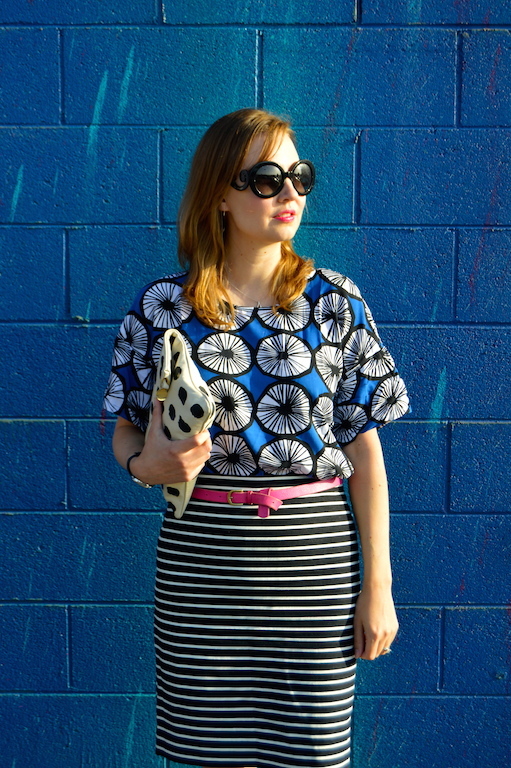 Such a fun print combination! Beautiful look! That wall is gorgeous and the wall together with your outfit is like a big piece of colorful art. The Target by me didn't have this Applesini set because I would have definitely grabbed both pieces, top and shorts. I only ended up getting the loud floral tunic dress and the matching sundress for my daughter. I was disappointed too. They had many cute prints but most of it was beach stuff like you said. Too bad. Some prints weren't even in clothing just pillows and other home accessories. I am talking pretty dresses and skirts for Spring, in today's post too. Come check it out. =) You would like it. And I would love for you to linkup with me tomorrow too, thank you. Have a great rest of the week! !